Aprenda a escorar entre as famosas ondas na costa norte de Oahu durante esta aula de duas horas. No Haleiwa Beach Park, conheça o seu instrutor de surf licenciado que lhe ensinará o básico e o ajudará a pegar ondas suaves. Nenhuma experiência é necessária, e os surfistas iniciantes podem escolher entre aulas particulares, semiprivadas ou em pequenos grupos à tarde ou de manhã. O uso de todos os equipamentos, incluindo prancha de surf e roupa de mergulho, está incluído. Faça o seu caminho para Haleiwa na costa norte de Oahu, a cerca de uma hora de carro de Waikiki. Encontre seu instrutor licenciado para começar sua aula no Haleiwa Beach Park, começando com o básico sobre a terra seca. Aprenda a remar e a se levantar e pegar uma onda. Uma variedade de opções de aulas em pequenos grupos garantem a atenção personalizada. • Aula em família privada limitada a três alunos por instrutor; sem restrição de idade Depois de se sentir confortável com o básico, coloque seus sapatos de recife e roupa de mergulho e bata na água, que é uma temperatura média confortável de 74 graus F (23 graus C). Em uma enseada protegida, a salvo de grandes mares, pegue ondas suaves com seu instrutor ao seu lado. Toda a experiência é adaptada ao seu nível de habilidade e conforto. O mais provável é que você consiga se levantar durante sua primeira aula de surf e, possivelmente, até pegar ondas sozinho. I’ve always wanted to try surfing but never braved it until this trip. My Instructor was patient and upbeat even though I was scared to even try? He kept right next to me the whole time and the pictures they took turned out great. I loved it and am amazed I stood up several times my first time on a board. Thanks for the experience! it was a great time! We enjoyed this experience and are glad we gave it a try. Our guide was very knowledgeable about surfing and did an excellent job helping us get comfortable on the board. She gave us many opportunities to try and stand up on the board and helped us get back into formation to catch the waves. Part of the fun was watching the other surfers on the water who were amazing. We recommend this tour to anyone who wants to learn how to surf and experience it at the North Shore! THE SURFIN GIRLS WERE GREAT! THEY WERE VERY HELPFUL IN MAKING SURFING ON THE NORTH SHORE AWESOME. CAROL and CAT WERE GREAT INSTRUCTORS!! 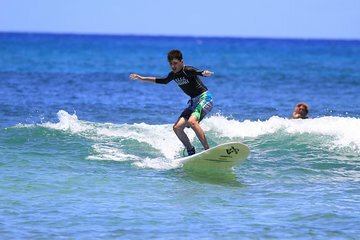 Wenn man auf Hawaii ist muss man surfen, dachten wir uns. Gesagt - Getan! Wir haben diesen Kurs gebucht und es hat sich die einen Riesenspass gemacht. Man bekommt eine kurze Einführung in die Grundlagen des Surfens und schon geht es ab. Mit Hilfe der Instruktionen haben wir alle die Wellen zumindest einmal stehend geritten. 2 Stunden sind mehr als genug, denn das Ganze ist auch für Ungebübte recht anstrengend. Am Ende es Kurses kann man Bilder von sich für ca. 75 USD als CD erwerben, muss aber nicht! Die Lehrer waren total nett und konnten einem alles gut erklären! Gutes Anfängergebiet. Would give this 10 Stars!!!! It was the best day ever!!! Our teacher Alexis was excellent! We were both able to stand and surf the waves immediately! Great remote location on the North Shore where they hold the lesson and easy to find. They were very friendly and gave us pointers to get better. It was for sure the highlight of our trip! Great instruction and instructors. Very nice and accommodating team. Perfect for your first time. Professionell surf teacher. At the end of the lesson I rode the wave complete. Location was okay for beginner.